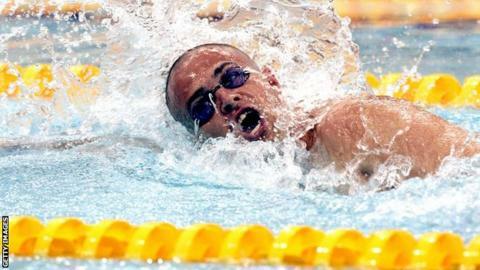 Swimmer Dave Roberts has not been selected for the ParalympicsGB team for the London 2012 Games. The 11-time gold medallist missed both the 50m and 100m freestyle times at trials in Sheffield at the weekend. Roberts, 31, will miss the opportunity to overtake Tanni Grey-Thompson's medal tally and become the most successful British Paralympian of the modern era. But Liz Johnson, who also failed to hit her mark at the trials, has been nominated for a place in London. Sixteen British swimmers, including double Paralympic gold medallist Ellie Simmonds, have been selected for the squad while a further 26 other nominees, including Johnson, who is a defending Paralympic champion, and her breaststroke rival Charlotte Henshaw, will have to wait until early June to have their places confirmed when the International Paralympic Committee formally confirm the number of slots made available for the team. 11 of the team will be 18 or under when they compete at the Games. Cardiff-based Roberts has suffered a run of career-threatening injuries and illness in the last two years, and acknowledged at Sheffield that he may have timed his push for a Paralympics place too late. "I tore my triceps last year and the surgeon said it should be a career-ending injury, and if it wasn't for the London Games I probably would have retired," he said, whose best of 1:42.16 failed to meet the one minute 40.87 second standard for the 100m freestyle. "I couldn't have done much more, but that last race was maybe one race too many," Roberts continued. "London is a home Games and I dearly want to be there, but sometimes you have to listen to your body and maybe it is time to take stock." British Swimming National Performance Director, John Atkinson, also confirmed that if more slots become available for the GB squad at a later stage, they will be given to development level athletes, rather than Roberts. "Dave has not and will not be selected because he failed to make the qualifying times in the two trials and because of illness and injury problems. His performances of late mean that he's not ranked high enough in the world to be considered medal potential," he said. "I am really pleased to see a strong squad of athletes set to represent ParalympicsGB at this year's Games. We have a great mix of youth and experience within this group and with 45% of the athletes preparing to take part in their first Games, I am sure our experienced athletes will help them settle into the routine of a Paralympic Games." One of the veterans of the team Sascha Kindred will be appearing in his fifth Games in London and hoping to defend his 100m breaststroke and 200m individual medley titles. "Making my first games in Atlanta was great, but now to be going to my fifth Games, I couldn't ask for more, especially as it is a home Games," he told BBC Sport. "I'm really looking forward to swimming in London and getting the home crowd behind the British athletes. "It has been hard to qualify for London. The qualifying standards were set high to make sure we had the best squad going to London. It shows how much quality we have on this team and we are looking forward to winning as many medals as possible. "The sport has moved on massively since I made my debut in Atlanta. The Games have gotten bigger and there is now more attention from sponsors and the media. Now the Games is massive in its own right and has its own identity and it is moving forward every year. Beijing was incredible but the home support will make London even better and we will hopefully show the public what the Paralympics is all about. "There is pressure on me to retain my titles but I will go out there and give it my best shot. I know I can get race fast and get personal bests and hopefully that will be good enough to get me on the medal rostrum." The swimming team finished fourth on the medal table in Beijing, winning 41 medals, including 11 golds, and also finished second and third on the table in Athens and Sydney respectively.